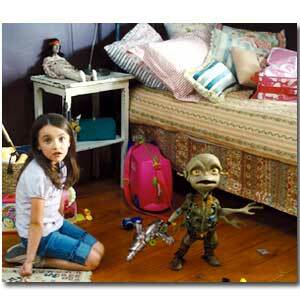 Seven-year-old Hannah (Ashley Boettcher) makes friends with Sparks, an extraterrestrial with four arms and hands. Aliens in the Attic will open in Philippine cinemas starting August 19, 2009. Inspired by family and friends' get-togethers, Aliens in the Attic brings together a pool of talented youngsters and seasoned Hollywood actors in an all-out battle against knee-high alien invaders. The adventure takes place in a three-story holiday house in the middle of nowhere. From the comfortable suburban house in Michigan, Stuart Pearson (Kevin Nealon) and his wife Nina (Gillian Vigman) together with their kids pack up for some good old-fashioned togetherness. In tow for the getaway are their adorable 7-year-old Hannah (Ashley Boettcher); techno-geek 15-year-old Tom (Carter Jenkins), and big sister Bethany (Ashley Tisdale). Joining them is Uncle Nate (Andy Richter), Nate's son Jake (Austin Butler), dear old Nana Rose (Doris Roberts), and identical 12-year-old twins Art (Henri Young) and Lee (Regan Young). An unexpected arrival is Bethany's beau Ricky (Robert Hoffman), who wrangles an overnight visit with the extended family. Suddenly, four glowing objects shoot toward the roof of the family's vacation house. The alien crew inside the objects is made up of Skip, the tough commander, Tazer, a muscle-bound dude armed to the teeth, Razor, a lethal female alien soldier; and Sparks a geeky four-armed techie, who is the only non-threatening alien intruder. It isn't long before all five kids see the strange new arrivals. Tom takes charge and the kids come to realize the alien mind control device only works on grownups, giving them a fighting chance against the invaders—and the responsibility to protect the adults by keeping the aliens' existence a secret. Left to their own devices, the kids unleash their imaginations, creating makeshift weapons. The adults remain oblivious to the alien presence and figure the kids are being...kids. Meanwhile, a touching friendship is struck between Hannah and Sparks, the friendly alien with four arms and hands, has no desire for battle, and just wants to return home to his family. Aliens in the Attic springs from the story by Mark Burton, who wanted to capture what he loves most about films for the family—high adventure, thrills, inventiveness and likable characters, both young and old. Burton, who also co-wrote the screenplay, was at home with his wife and family in London, enjoying the company of their grown-up friends downstairs while the kids were having raucous fun upstairs. What if, Burton imagined, the kids were battling some alien invaders, while we adults remained oblivious to the goings-on upstairs? For Burton, imagination is king and central to the adventure transpiring in the attic. "When my kids were younger we often used to have the neighbors around," he recalls. "We'd sit in the kitchen whilst all the kids would disappear upstairs, get massively overexcited, and end up having some huge game running around. One day I just looked up at the shaking ceiling and thought: what if that was a real battle and we didn't know? That became the essence of Aliens in the Attic it's an alien invasion movie where the kids are in charge and the adults have to remain clueless." Aliens in the Attic opens August 19 in theaters from 20th Century Fox to be distributed by Warner Bros.